This massive obstacle course is about as good as party inflatables get! Spanning a whopping 96’, this unit is chock-full of challenges and obstacles for your guests to overcome as they dash towards the exit! This unit features the “Caution” theme, which sports greens, yellows, and grays along with cautionary stripes that give the course an exciting and unique feel! 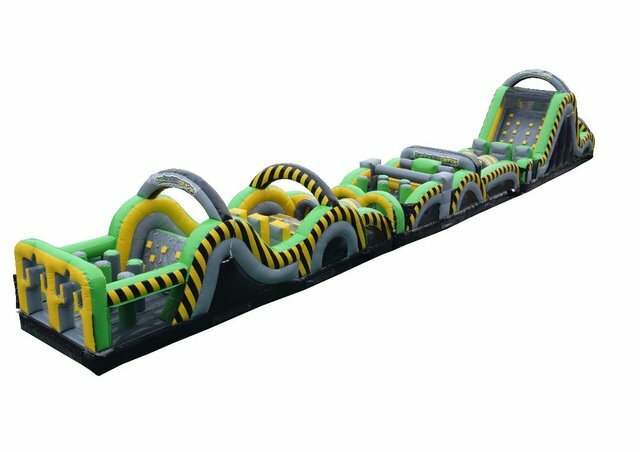 For something truly special, rent the 96’ Caution Obstacle Course for your next party or event! Make your reservation today, and provide us with any details on time constraints or delivery limitations we should know about it. For Saturday events, let us know if an earlier Friday delivery works too, as we can sometimes deliver a bit earlier than expected and at no extra cost!